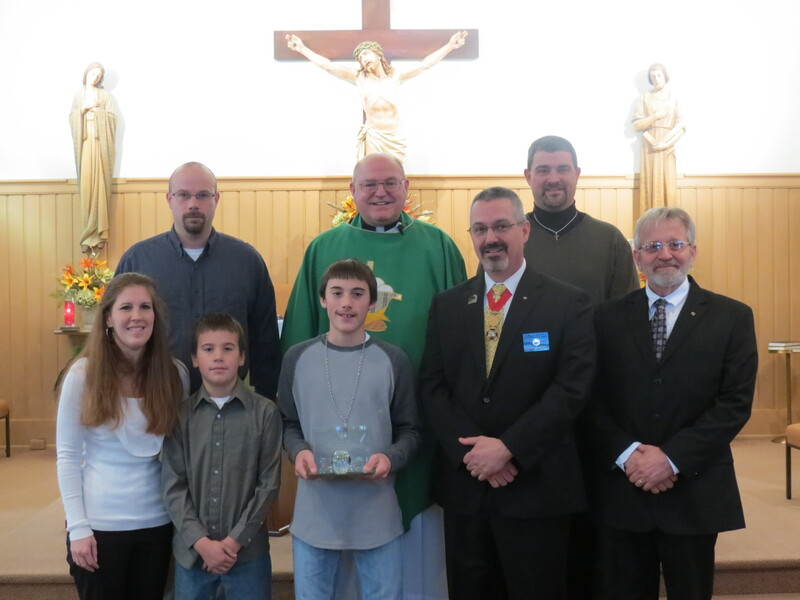 Ryan Shoemaker, an active member of Assumption Parish in Keyser (center), displays the trophy he received for being the Knights of Columbus International Free-Throw Champion for the 11-year old age group. The presentation was made at the parish youth Mass Nov. 16. Ryan shot 25 out of 25 free-throws at the state competition in Weston in March. He was the only 11-year old boy internationally to hit all of his free-throws. With him are (front row, from left), his mother Mandy; his brother Josh; Mike McDougle, state deputy of the West Virginia Knights of Columbus; and Les Halapy, grand knight for Council No. 10545 at Assumption Parish. In the back row, from left, are Ryan’s father, Corey; Father Bill Matheny, parish administrator; and Mike Stanislawczyk, youth director of Council No. 10545.